Snap.as is an easy way to get your photos online. Though it's already quick today (the uploader is the first thing you see), sometimes you need to upload a photo when you're in the middle of something else. Available for Chrome and Firefox today, our new browser extension pops up a tiny window to drag a photo to, no matter where on the web you are. The photo is uploaded and the Markdown gets copied to your clipboard, so you can paste it anywhere you want it to show up. Boom. Quick and easy. This is especially useful for Write.as users — in fact, it's primarily why we built it. Snap.as is meant to both stand on its own and work closely with the other products in our suite — and this brings your photos and writing together. A browser extension helps keep the Write.as editor clean while still letting you upload photos in the midst of your writing flow. It's an integration we're pretty happy with, and will continue tightening up over time. We hope you enjoy, and we'd love to hear your feedback on the forums! Today we're happy to introduce a new way for you to share your photos online without locking yourself (or friends and family) into a single photo-sharing platform like Facebook or iCloud. 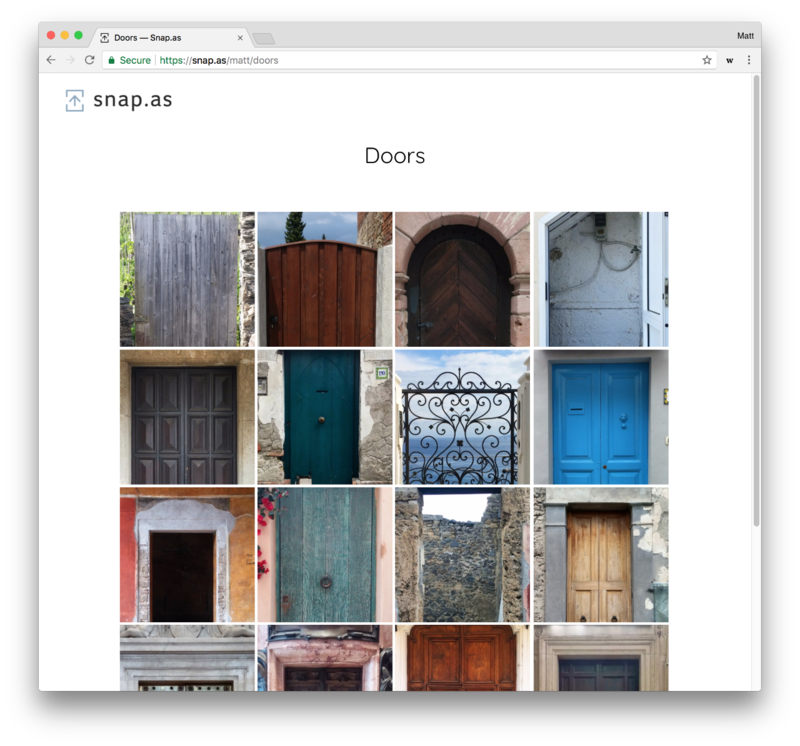 With Snap.as, just drag and drop a few photos into your browser, pick a name for your album, and click once to create a beautiful, minimalistic gallery that you can share with a simple link. Under each photo, you can also add a caption formatted with Markdown. Add some text here to provide a little more context with your photo or tell a story. To get started, navigate to your upload page and click Create photo album... near the bottom of the screen. There you can purchase this new feature for just $10 once to unlock it forever. If you aren't happy with it within the first 14 days, we'll be happy to refund your purchase. This is a brand new feature we couldn't wait to show everyone, and there's much more to come, including more control over who can see your albums, how photos are sorted, and how albums look. Stay tuned for more updates on our Mastodon and Twitter feeds! We're wrapping up our pricing plans as we approach our April launch date for albums / galleries on Snap.as, and wanted to share what we've come up with so far. As always, we'd love to hear what you think via email or on Twitter. Everything we've learned from selling Write.as subscriptions has played a major role in how we're pricing Snap.as. Besides the times that we've offered discounts on our Pro plan because someone didn't need every feature, we've heard many people say they wanted a more à la carte pricing model — and we agree! Pricing that allows people to spend exactly as much as they're comfortable with feels better and more honest, so that's what we'd like to implement with Snap.as. Today, anyone paying $4 per month for a Write.as Pro subscription can upload their photos to Snap.as. In April, they'll be able to create simple photo albums like this one that they can share anywhere — and getting that feature will be a simple one-time charge, just like an in-app purchase you'd see in a mobile app. We see these one-time charges for new functionality as a way to make sure people get the features they want without overpaying, but also in a way that works for the both of us. In the future, optional features like design customization and custom domains could be small add-ons that you buy once and enjoy indefinitely. Besides that, we'll only charge for storage — i.e. how much server space you're using to store all of your photos. Write.as Pro users will see a larger amount of storage included with their subscription before they're ever charged, and Snap.as-only users will simply pay based on how much they use. You'll see more specifics around our pricing in the coming weeks, but we wanted to give everyone a heads-up ahead of time. We can't wait to show you what we have in store! Hey there! 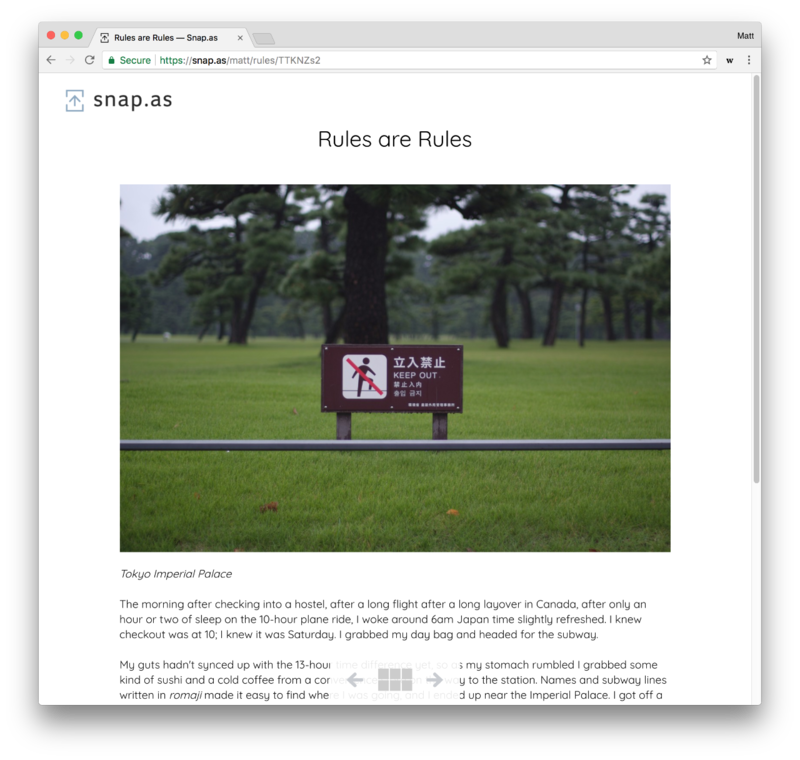 After a few years of planning, we're about to launch our very first complement to Write.as this week: a photo-hosting service called Snap.as. We're still in the very early days of this product, so we're calling our initial release an alpha version — very bare-bones, not completely polished, but still useful right out of the gate. When we launch, you'll be able to quickly upload photos, save a note for each (more on this below), and get their URLs to include them in your Write.as posts. We were planning to include the ability to import any existing images on your Write.as blogs, so they could have a permanent home within the Write.as suite of products. This is still coming, but not with the launch. We decided it's better to make sure this core product is solid, then add that feature next. We are including the option to save text along with your photos. You'll see all it can do as we evolve, but it's part of what will set Snap.as apart in the future as a photo blogging platform. For now, you can save a short blurb or a Markdown-formatted essay with each photo, and some of it will be used as the photo's alt text, and it'll be saved for later. Include hashtags and they'll come in handy down the road. Snap.as will be open to all active Write.as Pro users from day one, and we'll keep it available only to Pro users for the foreseeable future, as we think this product makes that monthly $4 subscription fee go much farther. We can't wait to show you what we've built (and have planned). Stay tuned here and on Twitter for more updates!